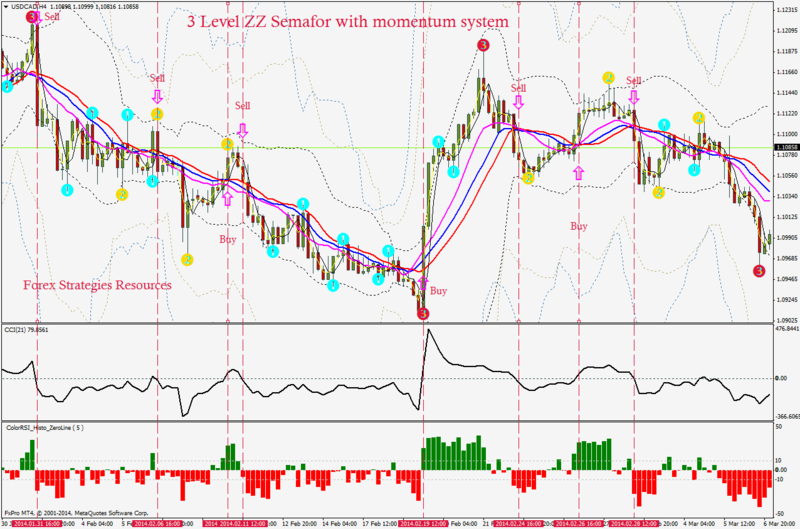 3 Level ZZ Semafor System is an Price action with momentun forex strategy. Time Frame 1H, 4H or daily. Markets: Forex, Indicies, Futures, Metals: Gold and Silver. 3_Level_ZZ_Semafor = the numbers 1, 2 and 3 signals the buy/sell/exit actions. acts on the signal when all other indicators agree. Color RSI Buy signal when green Bar abovee 10 level, Sell signal when red bar below -10 level. (This conditions is optional) Two moving averages buy signal when above midlle bands of the Guppy middle bands of the BB. Sell signal when below midlle bands of the Guppy middle bands of the BB. 8-12 pips above/below the candle with the 3 Level ZZ Semafor Dot 2 or 3 that you're basing your trade entry. close first half at Bollinger Band's middle line. In the picture 3 Level ZZ Semafor with momentum system in action. thanks mike.i will follow this. 3 Level ZZ Semafor with momentum system.